Radiation Protection Products manufactures a full line of radiation shielding materials, nuclear shielding materials, and industrial lead products. 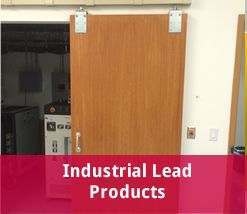 Our product line includes radiation shielded doors, lead lined drywall and lead lined plywood, leaded x-ray safety glass, leaded glass, lead lined door frames, radiation shielded window frames, and many other industrial lead products. We have over 50 years of radiation shielding experience and our products meet or exceed industry guidelines for radiation protection. Our radiation shielded windows and radiation shielded doors are manufactured in a range of standard sizes with custom options available. The sheet lead used in our radiation shielded walls and doors is also offered in various sizes with thicknesses up to 1” to meet any shielding requirements. You can trust our experienced team to help you find the right shielding products and our expert installers will make sure everything is installed correctly. Click here for submittals or request a quote today! 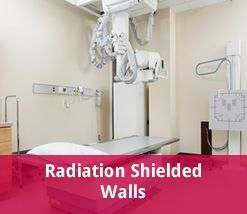 Radiation shielded walls, windows and doors are used in a range of application including PET rooms, linear accelerators, HDR rooms, gamma knife, and nuclear power plants. 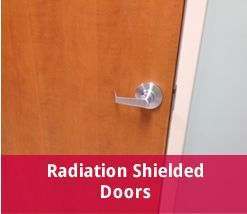 We provide turnkey solutions for radiation shielding and offer design assistance, estimates, and installation for all our door, windows, and industrial lead products. Learn more about our products or contact us to discuss your radiation shielding requirements. View our case studies to see examples of past projects. 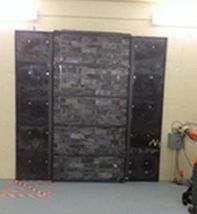 Radiation shielded walls guard people against radiation exposure and are used in radiation therapy rooms, laboratories, diagnostic images rooms, and similar applications. Our line includes lead lined plywood, lead-lined sheetrock and lead bricks for building radiation shielded walls. Bricks are constructed of pure lead and measure 3/4” thick. Plywood is lined with sheet lead in thicknesses from 5/32” to 11/16”, and drywall is lined with sheet metal ranging from 1/32 to 1/8” thick. Our sheet lead meets Federal Specification QQL-201 F Grade C and ASTM B749-03 Standard Specification for Lead and Lead Alloy Strip. 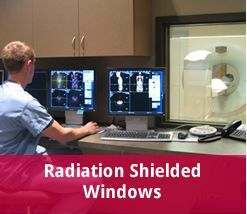 Radiation shielded frames and glass are available in multiple density ranges and provide effective radiation shielding without impacting visibility. Standard sizes range from 8”x10” to 108”x54” with custom sizes available upon request. Radiation shielded windows are offered with telescoping window frames to accommodate wall thicknesses up to 6” and our glass is available in several styles for door or wall installations. All our leaded glass meets Federal Specification DD-G-451. 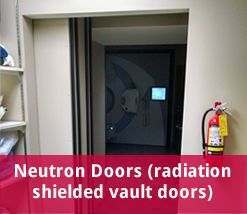 Neutron doors shield against highly dangerous neutron radiation for use in applications involving linear accelerators, proton therapy, gamma knife, H.D.R. and more. 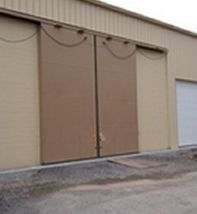 We manufacture swinging and sliding neutron doors with lead brick up to 6” thick and a 1/4” thick steel faceplate. 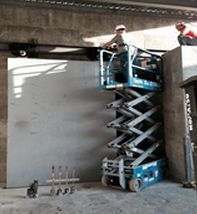 We also offer several safety options including presence sensors, battery back-up, and safety edges. 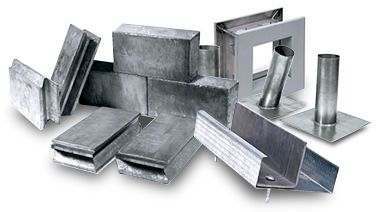 Our industrial lead products provide reliable radiation shielding and include lead ballasts, lead bricks, lead flashing, lead storage containers, and various other products and components to provide turnkey solutions. All our industrial lead products are made from pure lead and are available in standard and custom options to meet your shielding requirements.